The Sacred Mayan Journey will take place at Xcaret on May 17-19, 2012 for the 6th consecutive year. This event recreates one of the most sacred traditions of the ancient Mayan culture; the yearly pilgrimage to the island of Cozumel to worship the goddess Ixchel. 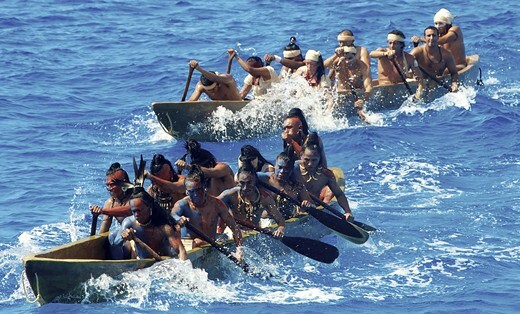 Men and women brave the Caribbean waters in canoes during this strenuous, life-threatening journey. This year, there will be a total of 268 rowers, 165 men and 93 women, who have trained for the crossing for over six months. 94% of the rowers are Mexican and the remaining 6% are foreigners from a various different countries. The entire project involves 488 participants. They will wear traditional Mayan dress and paint and recreate a typical Mayan marketplace and sacred ceremonies. The crossing will begin at Xcaret. Rowers will make their way through the treaterous waters to Cozumel. The next day they will cross yet again to Playa del Carmen. This year’s focus is a new beginning, based on the ending of a cycle and the beginning of a new one on the Mayan calendar on December 21, 2012.